We sell Solitaire City through BMT Micro who have a powerful affiliate system set up. If you haven't done so already, you need to sign up for a new Affiliate Account with BMT Micro so click here. 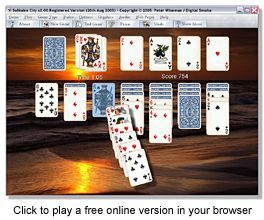 It takes about 2 minutes to set up and then you can login and add Solitaire City as an affiliate product. Login to the Affiliate Information Center with your new Login and Password. Click on the Products link on the left, then Full Product List and finally Games and Diversions from the Affiliate Product List. Scroll down the product list to Digital Smoke and then click on the Join button next to Solitaire City for Windows. Once the page refreshes, the Join button should have been replaced by Show links which you should click on to display the HTML code you need to paste into your webpages. That's all there is to it. There are two links - one that redirects you to the Solitaire City for Windows order page and one that redirects you to my website for a description of the game. If a potential customer clicks on my website link a cookie will be set on their computer that is detected by BMT Micro's order page if they should buy the game. It doesn't matter if they do that through my website or your own, today or in a months time. The cookie will tell BMT Micro that you are to be paid 25% commission if the customer eventually buys Solitaire City from BMT Micro. For more information about the BMT Micro affiliate program, such as how often you get paid, Login and read the FAQ.